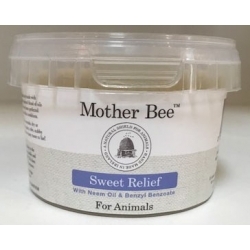 Mother Bee Sweet Relief Cream for Horses in a 280ml Tub. 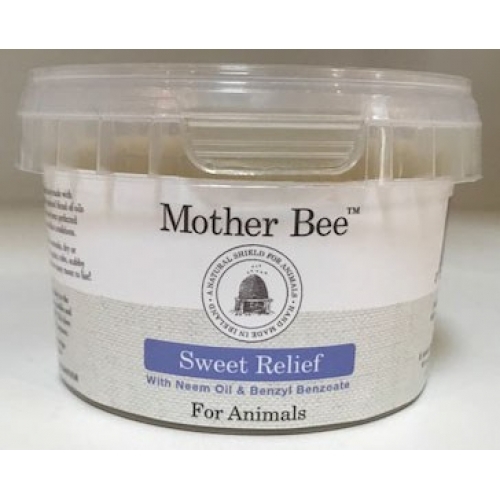 Mother Bee Sweet Relief Cream is for soothing and healing serious Irritations on Horses and ALL Animal Skin. Mother Bee's Sweet Relief Cream is made from an exclusive recipe of carefully selected natural ingredients to soothe & deal with irritated skin. The natural antibacterial properties have benefited horses and other animals with severe irritations, rubs, cuts and abrasions it soothes irritated and inflamed skin. Containing fly repelling qualities including Organic Neem Oil, it repairs the skin and provides a protective barrier whilst allowing the skin to still breathe. It also encourages hair growth. Made with 100% natural ingredients Sweet Relief is perfect for any animal with summer skin issues and an essential for your first aid kit.